Market Rasen Second XI extended their winless run in Lincolnshire League Division Three as the pressure increased on their promotion aims. Batting first against Holton Le Clay, the hosts began strongly with a good opening partnership from Freeman and Chambers. Chambers fell for 10, and Freeman was next to go, falling one run short of his 50 as the home side reached 95-2. Rasen’s top four all did well with Williams and Bradford scoring strongly, and both will have felt a half-century was within their grasp. The home side fought hard to add late runs, epitomised by captain Sam Williams who hit a superb 17 from only 18 balls. Rasen closed on 175-6 from their 45 overs, but probably felt they were 25 runs short of a good score for the conditions. Both opening bowlers had the Holton batsmen in trouble from the start of their reply. 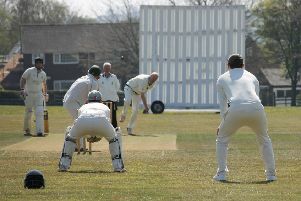 Wickets fell early and regularly as Holton were reduced to 81-5 with only their openers troubling the scoreboard. A brilliant innings from Tom Carter, who hit 75 runs from 71 balls, brought the visitors back into the game and led them to an unlikely victory. Holton reached their target with seven balls and two wickets to spare as Rasen passed up another chance of victory. Rasen dropped a place to third, but have a great chance to bring back a valuable 20-point haul from Brigg Town on Saturday.